Judge Yogesh Khanna said the case fell in the “rarest of rare category”, rejecting pleas for a lighter sentence. On Friday, Judge Khanna said the attack “shocked the collective conscience” of India, and that “courts cannot turn a blind eye” to such crimes. “This case definitely falls in the rarest of rare categories and warrants the exemplary punishment of death,” he added. “We are very happy. Justice has been delivered,” he said in the courtroom, according to the Associated Press news agency. They all deny the charges and can still appeal against the verdict to the Supreme Court and also ask the president for clemency – a process that could take years. The defence lawyers argued during the trial that their clients had been tortured and some of their confessions – later retracted – had been coerced. 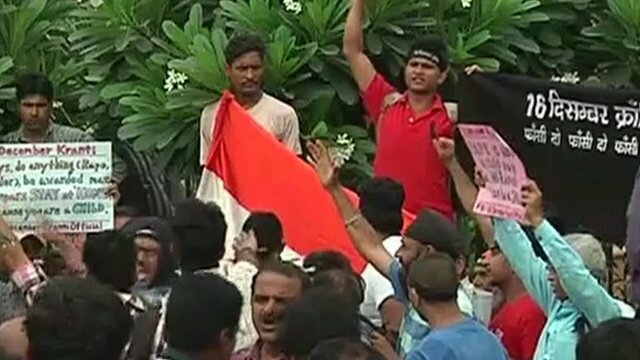 The road to the court was barricaded by police, and inside riot police took up positions as the lawyers were escorted in, the BBC’s Sanjoy Majumder in the Indian capital reports.